Staff and volunteers from the organisation behind the Royal International Air Tattoo (RIAT) gathered at Fairford Festival on June 3 to celebrate the volunteers and local community that make the airshow possible. 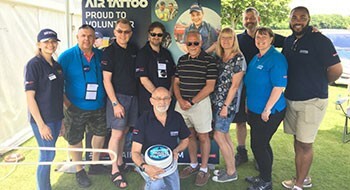 Staged in support of RAF Charitable Trust, RIAT heavily relies on its 1,500-strong volunteers to be a success - in recognition of this, RAFCTE staff invited volunteers to the RIAT 'proud to volunteer' marquee at Fairford Cricket Ground. The marquee gave volunteers and members of the local community the opportunity to participate in aviation-related games, where they could win limited-edition RIAT merchandise and find out more about the airshow and volunteers' contribution. During the event a special volunteer cake was unveiled and was subsequently donated to Fairford Festival to celebrate the RIAT volunteer team. Each volunteer also received a RIAT volunteer badge, goodie bag and food and drink voucher to use at the local vendors. Head of Volunteer Engagement for RIAT Kate McKinley said: "We rely on our loyal volunteers and support from the local community to make each airshow a success. The event wouldn't be possible without them! "Fairford Festival seemed like the perfect opportunity to express our gratitude to our volunteers and the local community." The festival was held at Fairford Cricket Club from May 31 - June 3 and featured an assortment of live music and stalls, as well as an art exhibition, photographic display, open air cinema, cake bake competition and 10k fun run.